For high-end display programs, CAR-Series™ coatings are index-matched to air and VC1-IM-Series™ coatings are index-matched to lamination to optimize display contrast (e.g., sunlight readability) while providing EMI/RFI shielding and/or transparent heating. 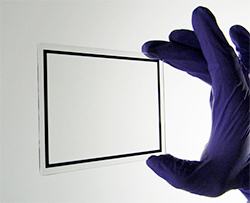 Utilizing the latest in thin-film vacuum deposition technology, Dontech’s CAR-Series™ and VC1-IM-Series™ index-matched ITO coatings on glass filters provide exceptional optical and electrically conductive properties. For high-end display programs, CAR-Series™ coatings are index-matched to air and VC1-IM-Series™ coatings are index-matched to lamination to optimize display contrast (e.g., sunlight readability) while providing EMI/RFI shielding and/or transparent heating. Dontech’s index-matched ITO coatings are used in demanding military, medical, industrial, and avionic applications. CAR-Series™ and VC1-IM-Series™ filters can be fabricated from a variety of glass substrates, such as chemically strengthened (soda lime, Corning® Gorilla®, or Asahi Dragontrail™), borosilicate, fused silica, and optical glasses (e.g., Schott nBk-7). Customization options include low photopic reflections and tightly toleranced resistances. The CAR-Series™ coatings and VC1-IM-Series™ coatings offer AR coating reflections as low as <0.4%, compared to Dontech non-conductive AR coatings which can be optimized down below 0.1%. ITO sheet resistances range from <1 Ω/□ to 300 Ω/□ with transmittances as high as >96%.